Mardones will rock with the Hurricanes on Aug. 3. 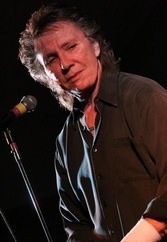 Benny Mardones is coming back to town. Mardones and his Syracuse band, the Hurricanes, rocking out for “Benny’s Backyard BBQ Bash,” Aug. 3 at Sharkey’s, on Oswego Road in Liverpool. It’ll be a big day of music and more. Six bands will perform, starting at 1 p.m. A “Chinese auction” will feature 100 items. The event will benefit the Carol M. Baldwin Breast Cancer Research Fund of Central New York. Mardones will return from his home in Playa del Rey, Calif., to the place on earth where he’s been the man through all the ups and downs of his career. The fans of Syracuse saved his soul from the pits of despair by jamming Long Branch Park some 30 years ago. The love affair has continued in both directions since. His knot of admirers has stuck at his side through tragedy — a horrible car accident, the death of too many friends and loved ones, his long fight against Parkinson’s disease. For their devotion, they are repaid with several Central New York shows a year and the right to share in his triumphs, too — his pride in the accomplishments of son Michael Everett, his discovery of love and marriage to wonderful Jane. And, they get to share in his dreams as he continues to write new songs, meet with Sly Stallone, network with hip-hoppers, strategize for that next big thing. The world mostly knows Benny Mardones as the guy who sang “Into the Night,” a classic rock ballad with the rare distinction of moving into the Billboard Hot Chart Top 40 twice, reaching No. 11 in 1980 and No. 20 in 1989. It’s still got legs; heard it the other day on satellite radio, in fact. Sharkey’s is the site of some of Mardones’ memorable summer shows, too, packed with sweaty fans on the back field when the joint was known as Hooligan’s. Also performing will be Todd Hobin, Mike McKay, Simplelife, Ben Fiore, Custom Taylor Band and the Rigbys. More acts are expected to be announced. Advance tickets will be given out for free at Romano Subaru on Hiawatha Boulevard. At the show, they will be $5 and up. Everybody going to the show is welcome to donate to the Baldwin fund.